Tokyo Otaku Mode Inc. (Incorporated in Delaware; President & CEO: Tomohide Kamei; hereby referred to as TOM), a company which operates a Facebook page sharing information about Japanese pop culture with over 17 million likes*, and e-commerce site Tokyo Otaku Mode Premium Shop opened up a flagship page on the Tmall Global branch of China’s biggest business-to-customer e-commerce site, Tmall, on May 18, 2015. This effort is powered by China Express, a service that helps companies open up shop in Chinese e-commerce offered by Alibaba.com Japan Co., Ltd. (HQ: Chuo-ku, Tokyo; Representative Director & President: Makoto Kouyama; hereby referred to as Alibaba). 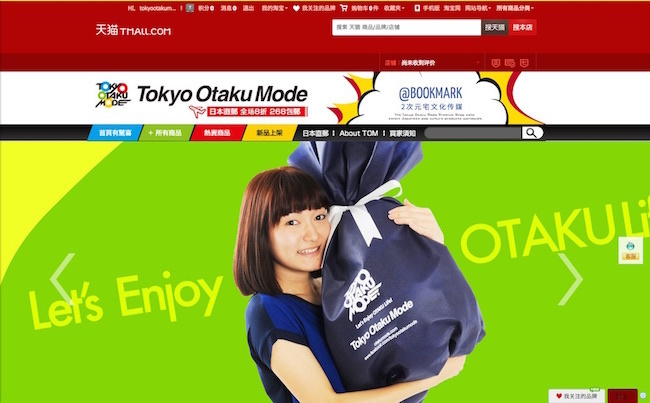 The Tokyo Otaku Mode Overseas Flagship Store (http://otakumode.tmall.hk) is the Tmall Global version of their homepage Tokyo Otaku Mode Premium Shop (http://otakumode.com/shop), which sells popular merchandise relating to Japanese pop culture. An opening sale was held from May 18-31, and carried approximately 100 different products including merchandise from titles such as Neon Genesis Evangelion (a series with huge popularity in China), Rilakkuma, Sushi Socks, Alpacasso, and more. Tmall Global is a global brand belonging to China’s largest business-to-customer site, Tmall. It specializes in carrying authentic foreign brands at relatively reasonable prices, and is known to be a trustworthy source safe from knock-offs. In order to limit the number of shops which get listed, getting listed on the site requires passing product authenticity assessments and quality control. In light of the rise of demand for Japanese products in China, Tokyo Otaku Mode Premium Shop opened up Chinese support on their official site in February 2015 for easier access by Chinese fans, while the site had previously been English-only. Now having opened their flagship site on Tmall Global, owned by the Alibaba Group, a brand fully integrated into Chinese public awareness, TOM hopes to be the destination to answer fans’ search for Japanese products and share the many unique products that Japan has with their Chinese audience. It looks like companies such as TOM and Alibaba who possess well-cultivated know-how of cross-border e-commerce operations may become the driving force in spreading Japanese pop culture within the Chinese region. TOM’s vision is to “Deliver happiness to the world through otaku culture,” and our foremost mission has always been to promote Japanese pop culture amongst a global audience. There are many fans of otaku culture in China as well, and we have seen the diverse demand for information and products as well. We are grateful to have the chance to not only answer the needs of already existing fans of Japanese pop culture in China, but to also create new fans via our presence on Tmall, the most well-known business-to-customer site in China. With the support of Alibaba, we are excited to advance our mission at this incredible pace. We are now in a time where “Made in Japan” has become synonymous with “high quality” throughout the world. Additionally, Japan’s media and entertainment is also calling international attention, with a big following in China. We are happy and honoured to be able to support TOM’s entrance into China through Tmall Global as they set the bar for the promotion of Japanese pop culture in a global setting. Tokyo Otaku Mode began on Facebook (http://www.facebook.com/tokyootakumode) on March 24, 2011 as a page sharing news, events, and merchandise relating to Japanese pop culture. Within 22 months, the page had over 10 million likes. Now at 18 million likes as of October 2015, they rank in the top 50 amongst other world-leading brands in the brand pages category*. Their e-commerce site, Tokyo Otaku Mode Premium Shop, launched in 2013, aimed at global consumers. The shop directly deals with manufacturers and makers of pop culture merchandise in Japan and curates items aimed for a global audience on its homepage. TOM also supports artists and creators within the industry by collaborating to produce and commodify original merchandise. In September 2014, the company received an official investment from Cool Japan Fund Inc., and continues to work to advance their mission of helping to bring the best of Japanese pop culture to fans all over the world. All other brand names, product names, or trademarks mentioned herein are registered trademarks of their respective companies and belong to their respective holders.